It's 9:10 pm as I start this and I thought about not writing tonight because it's getting late....oh. my. word. So lame. The kiddos continue to rock us this week. Husband and I have made it our goal to be in bed by 10 and we frequently out-lame ourselves and get to sleep much earlier. Last night I laid down on our bed as Husband finished getting Wade down, then he came and crashed next to me; we both fell asleep. The time was 7:45. It felt amazing. We were awoken by Wade informing us that his water cup was empty. So this is how I spend the last year of my twenties. Molar? Maybe? Is it bad that I'm hoping that's the answer and that this isn't just my child now. 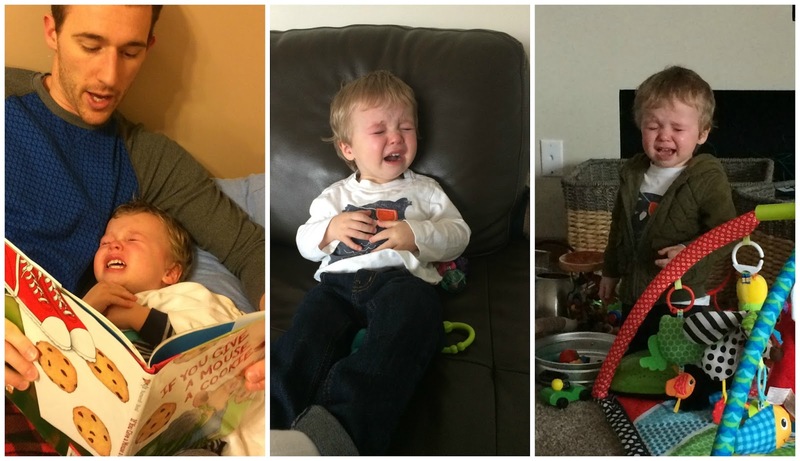 I'm not sure why he's crying in any of these - there are just so many reasons in a two year olds life to loose it! Wait, no. In the middle one he's crying because I put his arms through his shirt and he wanted to wear it just around his neck. I keep having to turn my head so he doesn't see me laugh at him. Poor kid, life is hard and mommy mocks us. Husband got something for his fish tank - don't remember/don't care what - and it was packaged in some styrofoam. Wade figured they were toys for him - naturally. I made the mistake of letting him take them to bed. There are little pearls styrofoam pearls everywhere! They just keep popping up, even though I vacuumed and cleaned! Exploding into every nook and cranny seems a prerequisite for kids toys. Sure, she opens her mouth to eat for her brother! Thank goodness he's gentle and paranoid about doing things correctly so he didn't shove the spoon down her esophagus. I love seeing my kids interact. I know it'll only get crazier, but I sure am excited to see the shenanigans these three pull. And, yes, Colonel Mustard did pick out his own clothes. The girls have tried carrots, sweet potato and corn - corn is by far the favorite. Baby food is getting a little more fun as the girls get the hang of it and I can tell they're enjoying it too. They like to open their mouths but block the spoon with their tongues or just shove all the food out with their tongues. I think it's a natural reflex at this stage, but can't wait for that to go. 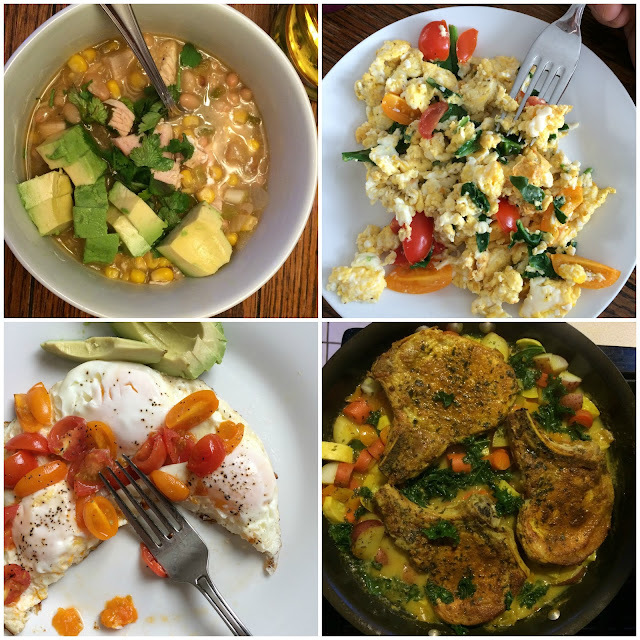 I've been having so much fun making new recipes and using more fresh food while doing this Whole 30 thing. I will say that it takes so much effort to prepare something new every day though - my usual rotation of meals is out. But since our kids have us on lockdown, it has also become an amazing avenue for me creatively - a true source of enjoyment that I can do all in my regular day. And Husband loves sharing good food with me too - we were just discussing that having better quality food on a regular basis at home beat out going out to eat occasionally. We are such homebodies, but at least our cuisine isn't lame. Added bonus: Wade has been loving everything I make - from curry to fish to zucchini! *Disclaimer: as previously stated, I've altered the Whole 30 to include beans and several grains to keep up my milk supply. So, if you're a Whole 30 purist, I know, I'm doing it wrong :). I took pictured of the girls today for Wade to use in his 6 month post about the girls (wait, what?!? They're almost 6 months?!) and they are adorable! Friday, get ready. I keep joking about how we are becoming these weird creatures of habit governed (imprisoned?) by our kids sleep. But I don't really mind. Maybe that makes me even lamer - or maybe it makes me more able to enjoy where I'm at? Yeah, we'll take that positive spin. Husband and I have been this equally yoked team lately. We're both tired and feel a little like we're running on empty, but we've been embracing the routine that allows us to play with our children and be present. Some nights it feels a little bit like we're stuck in the trenches in enemy territory - waiting for the next one to scream, but when they do we head back in together. All too often our bed is empty as I nurse a baby and Husband calms Wade. But we're in this together - we've been more understanding and patient with one another. We take turns holding down the fort so the other can go out. We make sure to enjoy together the precious little time between the kids bedtime and our own. Our life is one big chaotic routine. Isn't that what everyone is fighting against? Getting stuck in a rut and routine? Being tied down with responsibilities? I'm finding that our life is becoming more intentional, more fulfilling. I'm blissfully, exhaustingly happy. **Facebook just informed me that one year ago today we announced that we were expecting! Crazy to think that we had no idea we were having twins yet.